Early yesterday Apple released a new build for OS X Mavericks to AppleSeed members, and a few hours after the Golden Master version went live. This is a huge deal because it means we are just weeks away from a final release, and no doubt we will learn more during the iPad event later this month. With the OS X 10.9 Mavericks Golden Master download now live this opens other possibilities, such as the release of the Haswell MacBook Pro 2013 refresh, and even the Mac Pro, which if it does make it to this month’s event will get a huge amount of attention. 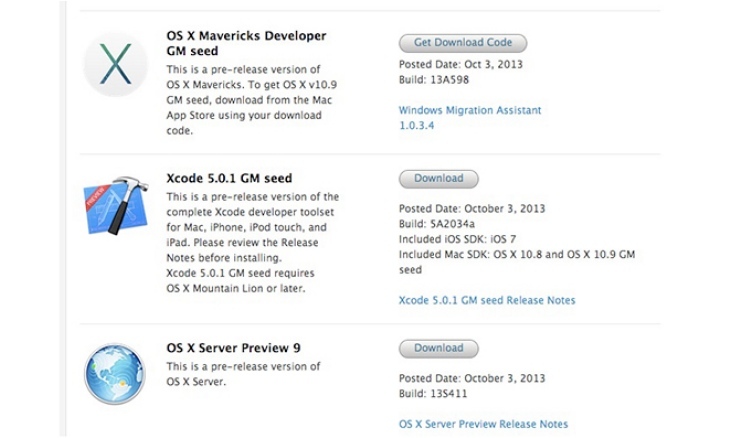 9to5 Mac reports that along with the release of OS X Mavericks GM were several updates, allowing developers to get to grips with some of the new features, just hope some of them share details with us — although that’s highly unlikely? This is the final version of the new operating system before its public release, meaning this is the finished version. From what we have seen so far, this does look like it will be a great version of OS X thanks to several new additions. However, we are looking forward to next year, as this is when we expect to see OS XI, which could go down the iOS 7 route, meaning it could be simplified. Speaking of the mobile OS; Apple is training its AppleCare support staff for Mavericks in the same way they did for iOS 7. Let us hope Apple has not rushed out Golden Master too quickly, although some of you will feel as though Apple has done this to coincide with the release of the MacBook Pro refresh and the all-new Mac Pro. What else do you expect to see at this month’s Apple event? We know there will be two new iPads, new Macs mentioned above, and possibly a new Mac Mini, although we are not certain about a new Apple TV.